NEW! April 2019: Free Fontographer for Mac update to version 5.2.4 build 7022 fixes font opening problems on macOS 10.14.4. DOWNLOAD! With Fontographer, it’s easy to design new typefaces and to customize existing fonts, and the result will be high-quality fonts that can reliably work across different operating systems. Unlike any other font editor on the market, Fontographer 5 combines an easy, intuitive and very efficient user interface with our mature, state-of-the-art font creation technology, making it a perfect font editor for graphic designers, DTP professionals, calligraphers and type designers who do not wish to dive into the technical details of font creation. Originally developed by the same team as the drawing program Freehand, Fontographer (or "FOG" as some call it) was the first software product on the Mac ever to include Bézier drawing tools, and has been famous for its clean, robust and easy-to-use user interface ever since. Thanks to the completely restored font generation engine, Fontographer builds PostScript Type 1, TrueType and OpenType fonts with the same quality as our high-end FontLab Studio product (it also supports less-popular formats such as Type 3 and Multiple Master). TypeTool 3 Free update from FOG 5.0: read the details! TypeTool 3 Upgrade from FOG 4.7.x for just US$149 and from FOG 3.x, 4.0.x or 4.1.x for US$199. Upgrade now! TypeTool 3 It’s only US$399, scroll down for detailed purchase options. Want to compare features between Fontographer and Fontlab’s other font editors? See the product comparison. ...with a copy of David Bergsland's new Practical Font Design Fontographer Edition, the e-book you need to learn the skills of type design. Available separately or bundled with Fontographer. While FontLab Fontographer 4.7 was a small improvement over version 4.1, version 5.2 is a major overhaul of the product. We’ve remained close to the Fontographer spirit yet brought the improvements necessary for a modern font creator in the 21st century. Our work on Fontographer 5 was like a restoration of a classic car. We’ve kept the familiar, elegant body that users love, giving it just a subtle facelift. And then we’ve replaced the old inefficient engine by modern cutting-edge technology. Seasoned users of Fontographer 3 and 4 will quickly find themselves at home, and new users will find the product very easy to learn. —plus countless additional improvements and bug fixes. TypeTool 3 RLM and Keyserver support for serving multiple licenses from a server. Great for computer labs! Imports fonts with 32,000 glyphs as OpenType PS (.otf), Win TrueType / OpenType TT (.ttf), Win Type 1 (.pfb + .pfm/.afm), ASCII/Unix Type 1 (.pfa + .afm), Mac Type 1* (LWFN), Mac Type 1 Suitcase* (FFIL), Mac TrueType* (.dfont or FFIL), TrueType Collections (.ttc), Win Multiple Master (.pfb + .mmm), Mac Multiple Master*, FontLab 3.0-4.6/TypeTool/ScanFont/FontLab Studio (.vfb), Also imports glyphs as Adobe Illustrator 8 EPS (.ai, .eps), TIFF, BMP. Exports fonts with 32,000 glyphs as OpenType PS (.otf), Win TrueType / OpenType TT (.ttf), Win Type 1 (.pfb + .pfm/.afm), ASCII/Unix Type 1 (.pfa + .afm), Mac Type 1* (LWFN), Mac Type 1 Suitcase* (FFIL), Mac TrueType* (FFIL), Win Multiple Master (.pfb + .mmm), Mac Multiple Master*, FontLab 3.0-4.6/TypeTool/AsiaFont Studio/ScanFont/TransType/FontLab Studio (.vfb), Bitmap Distribution Format (.bdf). Also exports glyphs as Adobe Illustrator 8 EPS (.ai + .eps). Note: OpenType Layout features can be specified as an external text file in the Adobe FDK for OpenType (AFDKO) version 2.5 format. OpenType Layout features are not preserved when an existing OpenType font is opened in Fontographer. We recommend DTL OTMaster to export AFDKO feature specifications from existing fonts and import them into Fontographer. 530+ pages of documentation (manual and technotes). Fontographer 5 for Windows: Modern Intel-compatible computer with 64 MB RAM and a hard drive, Windows XP, Vista, 7, 8 or 10. Fontographer 5 for Windows is a 32-bit Windows application, but can run on 64-bit. On Windows 8 or Windows 10, Fontographer needs to be run in XP compatibility mode. Fontographer 5 for Mac: Intel-based Mac computer with 64 MB RAM and a hard drive. Mac OS X 10.5 or higher (including macOS 10.12). Works in half-res mode on Retina screens. Fontographer 5 for Mac is a 32-bit universal binary application. Multi-seat licenses available for Keyserver or RLM license servers. "Fontographer 5.1 is the best-in-class font editor, the flagship application that has launched a thousand faces (and more). Not only does it excel as a powerful and flexible font editor, it enables the serious typographer to customize their existing fonts, add new glyphs as needed; critically adjust kerning and spacing; convert old fonts to a new format; and more." ?Every design studio should have Fontographer 5 for its wealth of font creation, editing, fixing, and conversion abilities.? ?The engineers at FontLab have produced what is without question the best upgrade ever to the venerable Fontographer program. The update of the interface retains the familiar Fontographer feel while providing a more modern look, and there are quite a number of improvements and new features. It's obvious there has been a lot of thought, time and effort put into this upgrade, and I am very grateful for all that work. My favorite new and improved features are the character antialiasing, OpenType and Unicode support, the ability to work with FontLab Studio .vfb file formats and the new hinting capabilities. Just these few things alone are going to make my workflow so much better, and they are but a small part of the long list of improvements. I highly recommend Fontographer 5 to anyone who is considering upgrading from earlier versions or is considering learning how to make fonts. Experienced users will love it, and I feel that even a new user who is skilled with other drawing programs would quickly adapt to using it.? ?Fontographer?s real innovations are below the surface. (...) Generally speaking, the Fontographer crew has delivered a solid upgrade ? with some room for future improvements. (...) Fontographer?s interface is much more intuitive, understandable, and therefore more easily accessible; a clear advantage for the rookie.? ?Fontographer has served as a critical component of the font outline creating/editing workflow for a large number of the world?s leading type foundries for over two decades. FontLab?s recent efforts to revamp and enhance Fontographer is important, and timely, in that it ensures that these same type foundries can continue to use this important application on contemporary operating systems.? "Fontographer 5.0, a Font Software product from fontlab.com, gets a 5 Stars SoftSea Rating"
"The new FOG5 is head-and-shoulders above my previous mainstay, FOG4.7. I was productive immediately, since all the familiar keyboard shortcuts and tools are still there. There are many new features, such as larger zoom(!! ), enhanced Font Information settings, new formats for output (.otf for Mac and Windows), and especially the larger, clearer whole-font display. Very highly recommended for font designers -- and graphic artists who want to fine-tune or enhance a font. Works like a Mac program should. A real winner." ?Fontographer?s virtue is in its relative ease of use. For designers used to programs such as Illustrator and Photoshop, Fontographer's tools are intuitive and easy to understand. ?What was the first B?zier drawing program for Macintosh computers? No, it wasn't Illustrator. Nor was it FreeHand. The answer is Fontographer.? ?Fontographer may be largely responsible for a creative burst of type design unmatched in hundreds of years.? Download the Fontographer 5.2 for Mac OS X demo version for by clicking any one of these links (~20MB, same file, different servers). Demo limitation: fonts are only partially saved and generated fonts are watermarked. All fonts created by the demo are 100% valid and can be tested in any application. This application requires Mac OS X 10.4 or higher. 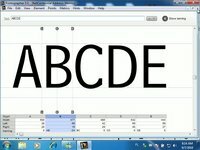 Download the Fontographer 5.2 for Windows demo version by clicking on any of the links below. (~9MB, same file, different servers). Demo limitation: fonts are only partially saved and generated fonts are watermarked. All fonts created by the demo are 100% valid and can be tested in any application. This application requires Windows XP or higher. Download the Fontographer 5.2 for Windows user manual (PDF format, ~4.2MB) - Sorry, the Windows manual is not ready yet. But the Macintosh manual (to the left) is almost the same except for screenshots. It takes up to a day to process an order. Usually we can get it done within a few hours and you will receive your serial number the same day. Occasionally it won't be until the next business day. Please enter your valid Fontographer serial number in the Additional Information field of the order form. Please enter your valid TypeTool serial number in the Additional Information field of the order form. printed manuals for our products from Lulu. Already a Fontographer user? Looking for a more powerful professional font editor with OpenType feature support, scripting, and manual hinting? Upgrade to FontLab VI for US$229!